Horsham, PA – CRC Industries, Inc., a global supplier of specialty chemicals for maintenance and repair professionals and do-it-yourselfers, has introduced the new CRC BRAKLEEN Pro Series Brake Parts Cleaners. 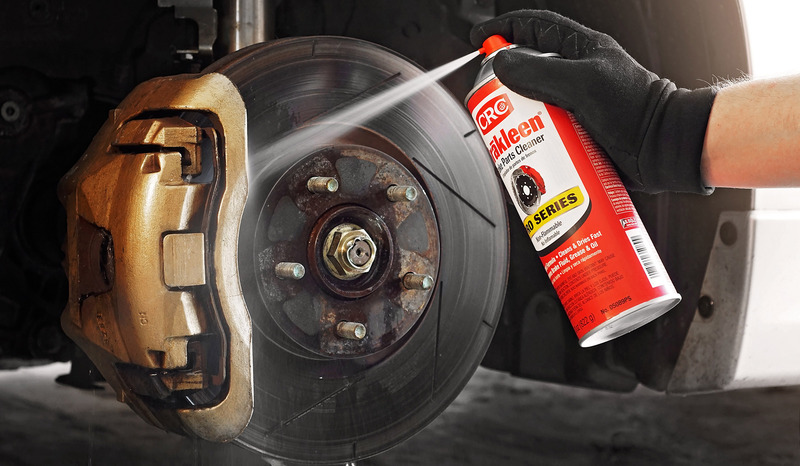 BRAKLEEN, the original aerosol brake parts cleaner, was developed in 1971. It was the very first product of its kind, and CRC is still the #1 brand used worldwide today. The new line of professional-use BRAKLEEN Pro Series cleaners offers increased fills, improved formulas, professional labeling and comes in four variations: Non-Flammable, 50-State VOC Compliant, Non-Chlorinated High VOC, and Non-Chlorinated Low VOC with less than 45% VOCs. The BRAKLEEN Pro Series Non-Flammable product (part number 05089PS) contains the same industry-leading formula as the original, strongest formula but offers 53% more product. The three Non-Chlorinated products in the Pro Series line have upgraded formulas and more cleaning power than their standard-size counterparts. All the new CRC BRAKLEEN Pro Series cans feature CRC PowerJet® spray nozzles. These provide a stronger spray with more mechanical force to remove grease and dust. To cater to the professional users, CRC BRAKLEEN Pro Series cans feature Globally Harmonized System (GHS) compliant labeling with the patented CRC S.D.[L.] ® label. The S.D.[L.] labels allow users to peel back the label of the can to reveal complete Safety Data Sheet (SDS) information. CRC BRAKLEEN Pro Series products are available at participating NAPA Auto Parts stores nationwide, AutoZone, O’Reilly Auto Parts and other quality automotive wholesale distributors and retailers. CRC Industries is a global leader in the production of specialty chemicals used by MRO and installer professionals and the do-it-yourself (DIY) consumer. CRC serves a variety of markets, including industrial, automotive, heavy duty truck, marine, electrical, hardware, and aviation. CRC operates worldwide in the regions of the Americas, EMEIA, and Asia Pacific, with 6 manufacturing sites and 14 distribution points, and is sold in over 120 countries. CRC trademarked brands include: CRC®, K&W®, Sta-Lube®, SmartWasher®, Marykate®, Weld-Aid®, Ambersil®, KF®, Kontakt Chemie®, Ados®, Action Can® and Kitten®. For more information about CRC Industries, visit www.crcindustries.com. New CRC Brakleen® Pro Series features larger cans and increased fill weights.